"Battle of Otranto" redirects here. For the naval battles, see Battle of the Strait of Otranto. The Ottoman invasion of Otranto occurred between 1480 and 1481 at the Italian city of Otranto in Apulia, southern Italy. Forces of the Ottoman Empire invaded and laid siege to the city and its citadel. According to a traditional account, after capture more than 800 of its inhabitants were beheaded. The Martyrs of Otranto are still celebrated in Italy. A year later the Ottoman garrison surrendered the city following a siege by Christian forces and the intervention of Papal forces led by the Genoese Paolo Fregoso. Relics of the Martyrs of Otranto inside Otranto Cathedral. The attack on Otranto was part of an abortive attempt by the Ottomans to invade and conquer Italy. In the summer of 1480, a force of nearly 20,000 Ottoman Turks under the command of Gedik Ahmed Pasha invaded southern Italy. The first part of the plan was to capture the port city of Otranto. According to a traditional account, a small group of 800 were left alive, whom the Turks tried to forcibly convert. Eight hundred men chained together, who had lost home and family, were given the option of Islam or death, and chose death. One man, a textile worker named Antonio Primaldo Pezzula, turned to his fellow citizens and declared: "My brothers, we have fought to save our city; now it is time to battle for our souls!" The 800 men, aged 15 and older, unanimously decided to follow Antonio's example and offered their lives to Christ. The Turks offered to return their women and children from the chains of slavery if the men would embrace Islam, and threatened the men with beheading if they refused to agree. The men still refused. On 14 August 1480, on the vigil of the Assumption, the 800 men were led outside the city and beheaded by the Turks. Their remains were later collected and are to this day kept in the Cathedral of Otranto. The Martyrs of Otranto were collectively canonized as saints by the Roman Catholic Church in 12 May 2013. Their remains are claimed to be stored today in Otranto Cathedral and in the church of Santa Caterina a Formiello in Naples. The traditional Christian historiography has come under criticism by later historians. Recent scholarship has questioned whether conversion was imposed as a condition for clemency. Although one contemporary Ottoman account justifies the massacre on religious grounds, Ilenia Romana Cassetta writes that it seems rather to have been a punitive action whose goal was intimidation. In August 1480, 70 ships of the fleet attacked Vieste. On 12 September, the Monastero di San Nicholas di Casole, which accommodated one of the richer libraries of Europe, was destroyed. By October attacks had been conducted against the coastal cities of Lecce, Taranto and Brindisi. However, due to lack of supplies, the Ottoman commander, Gedik Ahmed Pasha, did not consolidate his force's advance. Instead he returned with most of his troops to Albania leaving a garrison of 800 infantry and 500 cavalry behind to defend Otranto. It was assumed he would return with his army after the winter. Since it was only 27 years after the fall of Constantinople, there was some fear that Rome would suffer the same fate. Plans were made for the Pope and citizens of Rome to evacuate the city. Pope Sixtus IV repeated his 1471 call for a crusade. Several Italian city-states, Hungary and France responded positively to this. The Republic of Venice did not, as it had signed an expensive peace treaty with the Ottomans in 1479. In April 1481 Sixtus IV called for an Italian crusade to liberate the city, and Christian forces besieged Otranto in May 1481. An army was raised by king Ferdinand I of Naples to be led by his son Alfonso, Duke of Calabria. A contingent of troops was provided by king Matthias Corvinus of Hungary. Between August and September 1480, King Ferdinand of Naples, with the help of his cousin Ferdinand the Catholic and the Kingdom of Sicily, tried unsuccessfully to recapture Otranto. The Christian forces besieged the city on 1 May 1481. The Turks surrendered in August and left Otranto in September 1481, ending the 13-month occupation. The number of citizens, said to have been nearly 20,000, had decreased to 8,000 by the end of the century. Out of fear of another attack, many of these left the city in the following decades. ^ Csaba Csorba; János Estók; Konrád Salamon (1999). Magyarország Képes Története. Budapest, Hungary: Magyar Könyvklub. p. 62. ISBN 963-548-961-7. ^ "Martyrs of Otranto, entire village that chose death instead of renouncing their faith". Rome Reports. Retrieved 10 May 2013. ^ a b Nancy Bisaha (2004). Creating East And West: Renaissance Humanists And the Ottoman Turks. Philadelphia: University of Pennsylvania Press. p. 158. Recently, though, historians have begun to question the veracity of these tales of mass slaughter and martyrdom. Francesco Tateo argues that the earliest contemporary sources do not support the story of the eight hundred martyrs; such tales of religious persecution and conscious self-sacrifice for the Christian faith appeared only two or more decades following the siege. The earliest and most reliable sources describe the execution of eight hundred to one thousand soldiers or citizens and the local bishop, but none mention a conversion as a condition of clemency. Even more telling, neither a contemporary Turkish chronicle nor Italian diplomatic reports mention martyrdom. One would imagine that if such a report were circulating, humanists and preachers would have seized on it. It seems likely that more inhabitants of Otranto were taken out of Italy and sold into slavery than were slaughtered. Hubert Houben, ed. 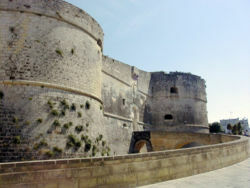 La conquista turca di Otranto (1480) tra storia e mito: atti del convegno internazionale di studio, Otranto–Muro Leccese, 28–31 marzo 2007. 2 vols. Galatina, 2008.